Shuhada is a memorial to the Palestinian civilians killed in Palestine by Israelis between September 2000 and November 2004. Each victim’s name and age is preceded by an M-16 bullet-tip piercing the canvas, symbolizing the unlimited free ammunition the United States gives Israel. The incomplete Star of David references the Zionist government’s misappropriation of the symbol of a religion, Judaism, for national identity. 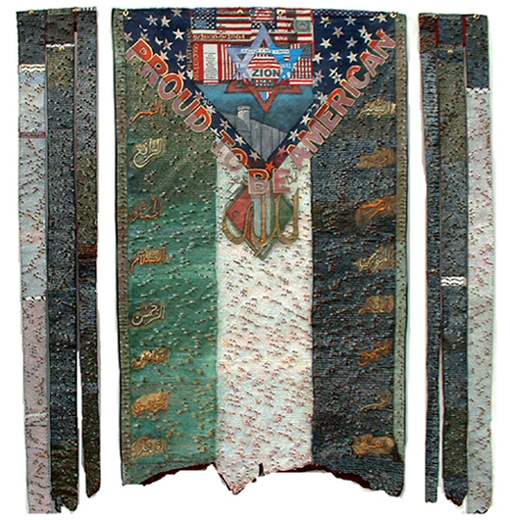 Co-mingled fragments of the United States and Israeli flags symbolize the US government’s historic support of Israel’s military invasion of Palestine. Nine of the ninety-nine Names of God are embroidered in Arabic calligraphy on the borders of the canvas.